What makes Fox Hills unique? What unites Culver City and Fox Hills? Within Fox Hills, how can we make sure we connect our voices? How do we deepen the connection between Fox Hills and the City? How can we ensure the voices of Fox Hills residents are heard? What do successful conversations within the Fox Hills community and with the City look like? What does being connected look like to you? What would you like to see for Fox Hills? The City of Culver City has been selected by the University of Arizona’s National Institute for Civil Discourse (NICD) as one of five “deep dive” cities nationally to participate in its “Revive Civility Cities” program. Revive Civility Cities is a nonpartisan program where the NICD works with and encourages communities to restore values of civility and respect for each other. 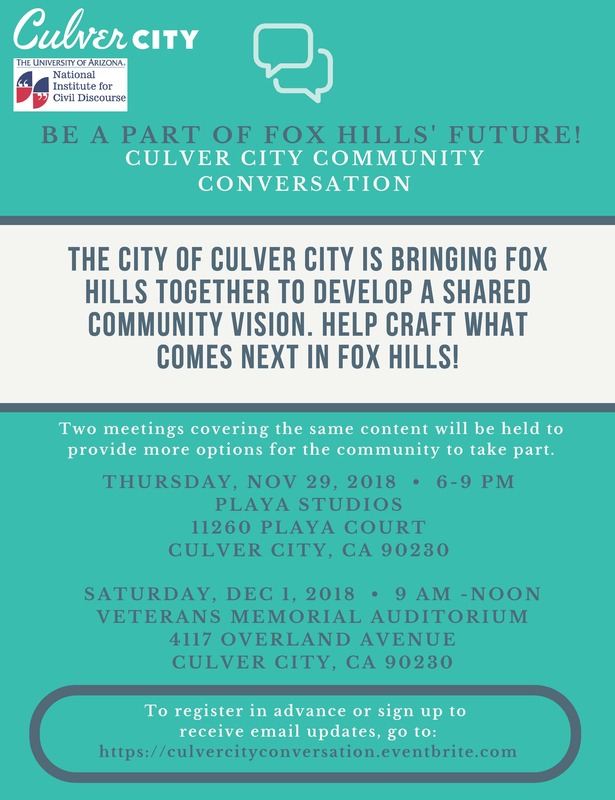 NICD will work with Culver City during the remainder of 2018 to help bring the City civil discourse strategies around the issue of growth and development in the Fox Hills neighborhood. Activities have included stakeholder interviews by the NICD, a declaration by the City Council of Revive Civility Month, and a series of community visioning meetings (see below for meeting dates). NICD will synthesize the input heard at the community visioning meetings and, based on that input, create a community vision and action plan. The community vision and action plan will be presented to the community for final input, and ultimately be presented to the City Council. NICD selects deep dive cities for its Revive Civility Cities program based on the city’s commitment to civil discourse, the nature and interest of the problem identified, the availability of resources (both from NICD and the city), and the likelihood that the project would be a useful case study for other cities. Culver City joins an elite group of participating cities located throughout the country, including Maine, Washington, Ohio, and Iowa. NICD Director Hala Harik Hayes will lead the effort in Culver City. Hayes has managed more than fifty civic engagement projects around the country, including a large-scale public engagement in New Orleans following Hurricane Katrina in 2005. The Culver City Advisory Board will provide input and advice to city staff and organizers on several aspects of the Community Conversation, such as messaging, outreach, discussion content, and follow up activities. Members include Renee Bayley, Colin Diaz, Michael Cho, Fred Puza, Judi Sherman, Will Rickards, Summer McBride, Nelson Algaze, Dave Saeta, Alisa King, Majit Asrani, Albert Vera, Deborah Wallace, and Diana Hernandez.